How did you get your start in bike racing? Were you one of the naturally talented juniors or did success take some time? Ha, no not a naturally talented junior. I never actually rode as a junior and didn’t start racing until I was 19 or 20. My first love in the wide world of sports was hockey. I’ve skated from the time I could walk and played hockey through high school. My older brother Robbie went to a prep school in central New Hampshire and had a teacher who convinced him to try out cycling. Robbie would come home in the summers and constantly be out on his bike, which, at that point, I still thought was fairly nerdy. It wasn’t until I actually got on a bike that I realized how much fun it was. The progression was fairly speedy from there. I started at Middlebury College in 2001 and it was that freshman year that nearby UVM hosted the collegiate national championships. I wasn’t really racing yet, but I went to those nationals and watched my brother win the first of his two national collegiate titles. After those initial random summer rides, that sweet level of competition was all I needed to get into cycling. I raced through college, did a stint with the national team in Belgium, “studied abroad” one semester at the University of Arizona to get some optimal winter riding, graduated from Middlebury in 2005, and started racing professionally from there. 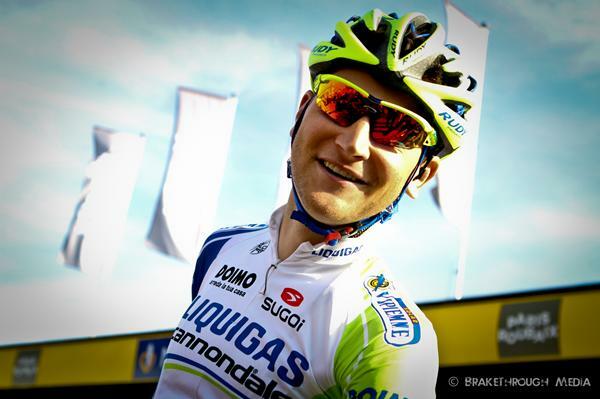 What was your path from those early days of racing to getting signed to Cannondale-Liquigas? As I was saying, the collegiate cycling ranks were really where I turned on the gas to ride more and more. Collegiate racing is just some of the best, most entertaining, most fun time I’ll ever spend on a bike. The camaraderie, the antics, the competition is all just perfect. Plus it requires a decent amount of discipline to stay fit, stay ahead academically, and be ready for the next race or exam. So collegiate racing, a lengthy summer with the US national team in Belgium (lengthy cause I finished school a half month early to make it to the early spring races in Euroland and then jetted back to school one week late that fall), proudly graduated with a degree in econ and math, then raced three years domestically before jumping into the European peloton. Two years with Cervelo TestTeam and I’ve been with Liquigas-Cannondale since 2011. Yeaa bikes. 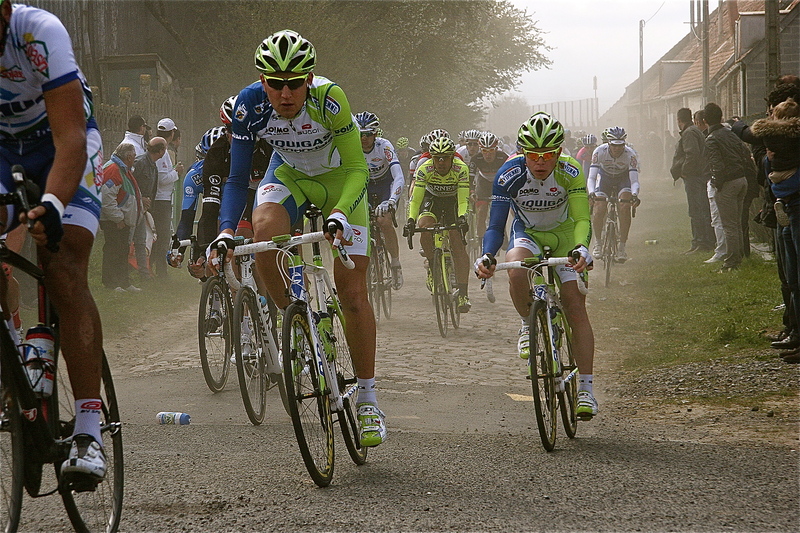 Coming off the cobbles at Paris-Roubaix. Photos via Ted’s blog. What was it like making the jump from top ranked domestic-level American in 2008 to grand-tour level pro in 2009? What were some of the biggest challenges? In the cycling world, everything in Europe is a superlative. The races are the longest, hardest, most technical, most demanding, most err … sometimes absurd that exist. 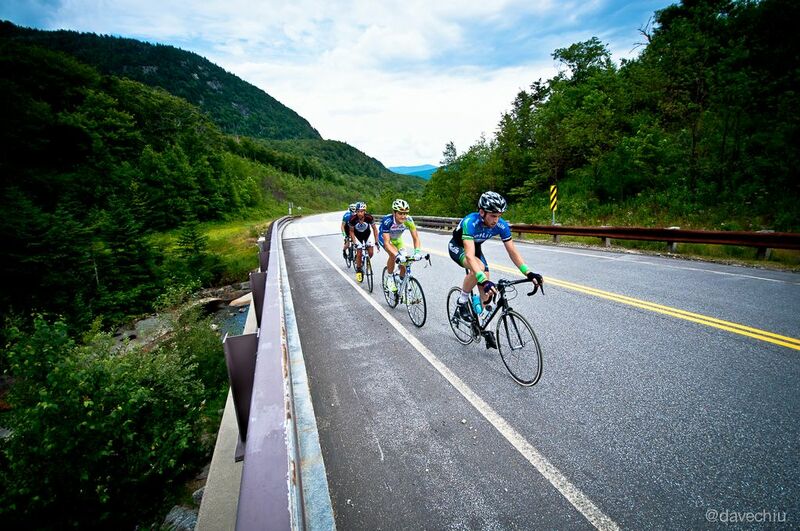 Simply on paper, the distances are considerably longer–be it within a particular day or the length of stage races–the climbs are longer, the speed is higher, etc, etc, etc. I’m not taking anything away from domestic races because that’s where I cut my teeth and got into this crazy world. There’s enormous talent here in America and more and more coming up every year. So just becoming accustomed to the longer, harder, faster races was the biggest thing. That’s mostly training and then training more. And faster. Another Tour de France has come and gone with several high-profile doping accusations and charges. Nonetheless it seems like the pro peloton is as clean as its ever been. Is that the case, or is it just another example of dopers staying a step ahead of WADA and the like? Absolutely I think the peloton is as clean as ever. The testing that teams do internally in addition to the tests at random at literally any given moment throughout the year is a testament to the continual cleanliness of the sport. Yes, doping will continue to be an issue for years to come, but it’s extremely promising to see–especially inside the peloton itself–that the entire stance on doping is changing for the better. Ted, Tim Johnson, and others riding this year’s 200 on 100 in New England. Photos via Ted’s blog. You are a 350.org athlete. How did that come about and what does it mean to be involved with that organization? 350.org began with Bill McKibben and students at Middlebury College. It was a grassroots effort to really spearhead climate change and help halt global warming. A very tall order, but something that needs to be confronted sooner than later. As I’ve mentioned, conveniently I’m a Middlebury graduate myself and this entire organization was taking root among my immediate peers on campus. It was awesome to have a scholar in residence the likes of Bill milling around Middlebury. It’s a phenomenal establishment with some of the smartest-yet-worldly minds on the planet. Given my stature in the athletic world and of course given my fondness for the environment, I was happy to become an athlete ambassador with 350.org. Bike races–professional, amateur, and everything in between–are very energy intensive events. Do you see some ways for racing to make less of an environmental impact? Sure, this is a tough question. It takes an energy to make an impact. It’s clear that cycling in general is an environmentally conscious thing to do. The number of brief errands that people tackle in the smoggy comfort of their cars is nauseating and those trips certainly add up quickly. On the fun, two-wheeled comfort of your bicycle, you get the benefit of a work out, you help save the planet, and you get some fresh air. Sheesh, the trifecta! Unfortunately the majority of America right now lacks the basic infrastructure that allows this to happen. It doesn’t make sense to ride ten miles down the road for a gallon of milk, whereas in much of Europe you can literally do your grocery shopping within a two minute bike ride. Admittedly, a bike race is obviously a very energy intensive event, beginning to end. I think, however, the simple promotion of cycling is a benefit to society at large. If it gets a kid interested in riding bikes, that likely means one less revved engine and corresponding burn-out to impress his friends and one more kid riding a bike to help save the planet. I have no problem intermingling a tough day of training with going to the post office, a simple grocery store run, and a trip to a friend’s house across town on a bike. It’s a drop in the bucket, but often that bucket gets filled one drop at a time. In that same vein, I gather from Twitter and your blog that you care about bike advocacy (and in a more thoughtful way than just wanting more people to ride bikes). What do you think professional cyclists like yourself and your colleagues can or should do to help improve bicycling in the US, both as sport and transportation? Like much of what I said above, especially in America, it’s a matter of simply getting out on bikes–the rest can unfold on its own. As there are more people riding, it’s up to folks with some influence (me and my colleagues) to set a good example; we need good relationships between cyclists and motorists so that the underlying animosity doesn’t perpetuate. That leads to the promotion of that infrastructure which brings about the environmental benefit of bicycles in the community. It leads to safer riding, it leads to a more healthy community, it leads to more community in general. That’s what cycling is all about: community. This entry was posted in Interviews, Racing and tagged bike advocacy, liquisgas cannondale, pro peloton, professional cycling, road racing, ted king. Bookmark the permalink.